you finally got it right? We meet Ursula for the very first time in November of 1930 as she pulls a trigger and darkness falls around her. We then return to the 11th of February 1910, Ursula’s Birthday and once or twice, the date of her death. Whether it’s a twist of fate, a change of weather or a spur of the moment decision, each of these things can affect Ursula’s life dramatically and for some reason, if it doesn’t seem to go right, she gets a chance to try again. As a child, she grows up with a constant sense of deja vu and occasional terror that influences her actions, a tremendous loss or a death resonating through from a past life to her current one. No matter how hard I try, I just cannot seem to describe this novel in any way that does it any justice. I raced through the first half the novel, desperate to take in as much as I could, then paced myself with the final half as I simply didn’t want it to end. 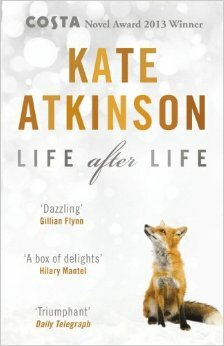 Past lives and reincarnation are nothing new in the literary world but the way Kate Atkinson handles such an intriguing idea is utterly refreshing. She’s picked a fascinating time period to set the novel, running from 1910 up to 1967, covering wars, illness, abuse and changing attitudes towards women. One of my personal reading downfalls is that I am easily lost with too many characters, which made me wonder if I would struggle to read a novel that jumps to different time periods, places and with different people. It’s a testament to Atkinson’s writing genius that the novel flows so smoothly that this worry couldn’t have been further from my mind while becoming swept away into Ursula’s world. To me, this novel has become an instant classic. Every time I put it down or came to a new branch in Ursula’s life I would find myself wondering about where it would go, who would be involved and what she may or may not change. Although the books plays with the idea of getting life ‘right’ I was relieved to find it didn’t try to make it perfect, what may be right for Ursula may not have ended up being right for the people around her. This book was a joy from beginning to end and although it takes you on a journey of shock, heartbreak and elation, it ultimately leaves you refreshed and uplifted. I really cannot recommend this book highly enough, no matter where my life takes me or how old I get, there will always be a copy of this novel on my bookshelf. This is a hard book to describe – but I kind of just want to give it to people with no explanation and watch them read it and 'get it'. I loved the dialogue and it really makes you think about making even the tiniest decision – anything could change your life, or the lives of others around you!